Dumbledore is one of my favorite characters in the Harry Potter series. I admire him for so many different reasons, most notably his wisdom. Dumbledore provided answers to almost all of the questions within the series. To me, the best Dumbledore moment was at the end of Deathly Hallows when he appears to Harry after Harry "dies." Dumbledore just being in that scene itself made the moment great. It was very hard for me going into Deathly Hallows knowing that Dumbledore was gone, so I was elated to see him one last time. The reunion between Dumbledore and Harry was also very meaningful. And I was happy to get some kind of explanation for Voldemort's behavior. I realize that I often end up choosing multiple moments, but this week's topic absolutely demands that I pick more than one, because it's Dumbledore. I love his moment with Harry in Sorcerer's Stone, when he warns young Mr. Potter about the Mirror of Erised and delivers that brilliant line about not dwelling on dreams and forgetting to live. In fact, that's probably my favorite Dumbledore quote ever. 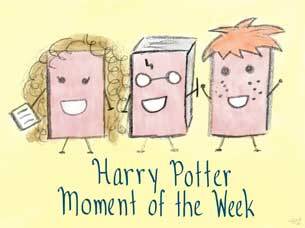 Another favorite moment is his unforgettable exit from his office in Order of the Phoenix; take that, Fudge and Umbridge! I also cannot fail to mention the cave scene in Half-Blood Prince, when the Inferi are closing in on Dumbledore and Harry and Dumbledore just ignites the place. Finally, this list would not be complete without the King's Cross scene, again with Harry, in Deathly Hallows. So. Many. Feels. Awww love that two of you have done one this week! We've all picked the King's Cross scene :) it's so, so powerful. He has so many epic moments, it's hard to narrow it down to just one! I just couldn't limit myself to one pick, lol. It was wayyyy too difficult! So true! There are just way too many incredible moments with this character, which is probably what makes him so brilliant and unforgettable. And what's great is that they're not all loud moments. Some of them are quiet and heartfelt, but no less impactful. Great picks, here's mine: HP MOTW. To me, everything he ever said and did was profound in its own way. Truly one of the greatest literary characters. Exactly! That potion was poisonous, and yet he still managed to find the strength to conjure all that fire! I LOVE that scene in the HBP movie so much. If I chose that would be my favorite thing..I think anyone who has lost someone they love can relate to that moment. Definitely. Like Ally, I also welcomed the closure after what happened in HBP. YES! I loved getting to see Dumbledore in that last scene and explain everything to Harry so well. That glimpse of his wisdom when he was gone, was much needed in that scene. I also love the mirror scene. It not only shows his wisdom, but that he knows what Harry is doing and is keeping an eye on him, yet letting him make his mistakes and learn from them. I chose the moment he disappeared on Fudge so I definitely love that one as well :D Great picks! Jaclyn @ JC's Book Haven. I really felt for Harry in the mirror scene and understood why he kept returning to see it. But Dumbledore was completely right about the danger of the mirror, and the way he explained it to Harry was just perfect. I definitely have to say I absolutely love Dumbledore. He has to be one of my favourite characters. He is so wise and genuinely caring. I have to agree about the Deathly Hallows scene in the King's cross station as my favourite scene with him! Great pick on all of those. He had so many brilliant moments throughout the series, and from reading through everyone else's posts, there were a ton I missed! The way he always seemed to know exactly the right thing to say in any situation is probably my favorite aspect of his character.